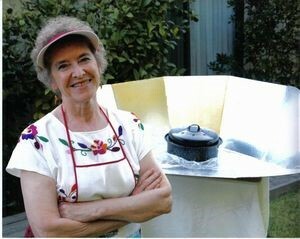 Beverly Blum has been an ardent advocate of solar cooking and enthusiastic solar cooker for decades. Ms. Blum was a founder of Solar Box Cookers International (SBCI) and served as the first President from 1987 – 1989 and the first Executive Director of Solar Cookers International (SCI) from 1989 – 1999 and again in 2003 – 2004. She continued her service to SCI as Board President from 2010 – 2011. Bev is a woman of vast and varied talents, including box cooker developer, author, trainer, and presenter. Beverly worked with engineers from University of the Pacific in Stockton, California to mobilize efforts to expand awareness for solar cooking and its potential value worldwide. She was instrumental in hosting the first solar cooking international conference. Bev wrote the following holiday greeting in 2007. 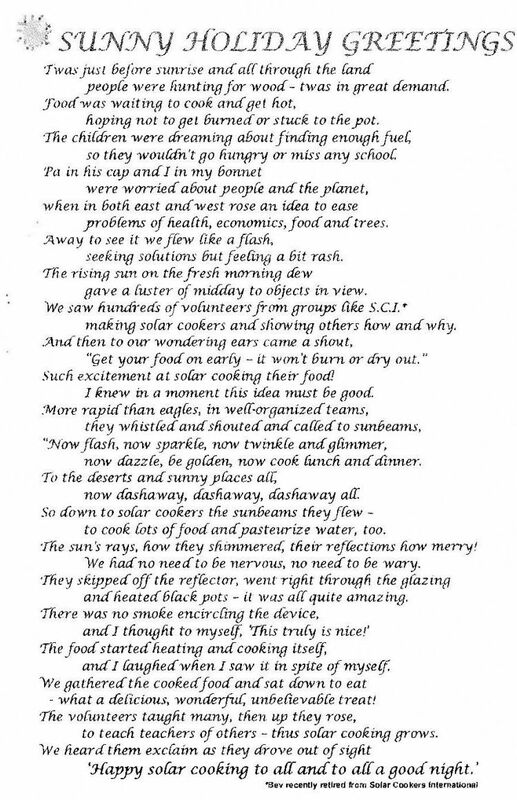 SCI is happy to share this holiday poem while wishing everyone happy and sun-filled cooking days in 2019.